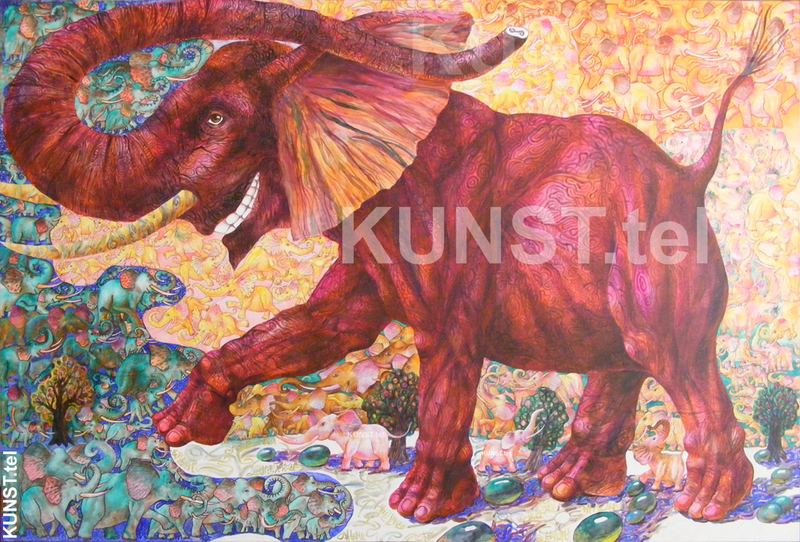 Portrait of Lithuanian Lady V.
When the summer of 2011 was ending, I got a commission to paint a big painting on canvas with a big red elephant and a lot of small elephants surrounding it. The size of canvas is 1 x 1.5 m, so it took me time to create this painting. Here I show how the work goes, from the beginning to the end, from charcoal sketches to a ready colorful painting. Ready artwork is made on canvas of 1.0 x 1.5 m with acrylic paints. STAGE 11. Today, at 31 of March 2012 I can say that painting of “Red Elephant” is ready (at least!). It is made with acrylic paints only. I decided not to mix them with oil paints. Let it be as it is. Also I covered it with few layers of varnish for acrylic paintings. I hope that in this way this artwork will last without need of conservation for some two or three hundred years. Please note, that colors you see on your monitor could differ from real colors of the painting. Later I will try to make better photos. Stage 11. 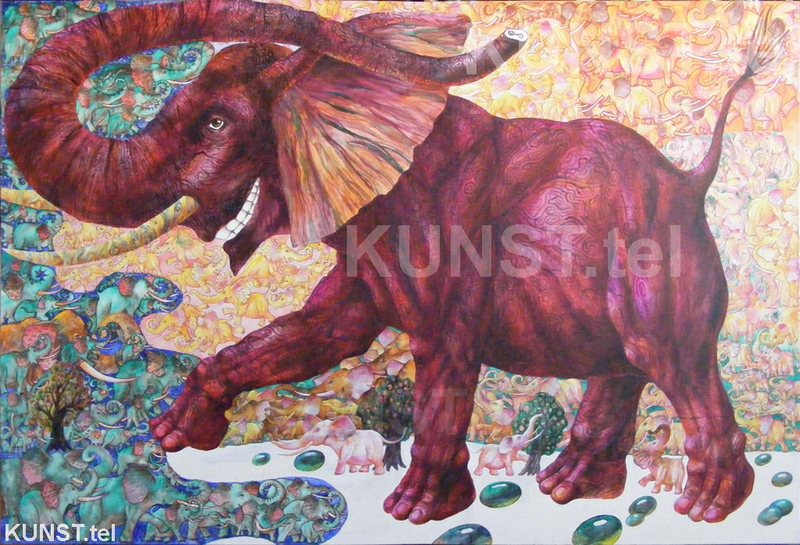 ACRYLIC PAINTING of “RED ELEPHANT” on CANVAS, Copyright 2012 © Leonid Zаdonski (Le-Za), size of artwork 1.0 x 1.5 m – the artwork is ready! STAGE 10. The work on the canvas with acrylic paints is almost finished. At this point I need to decide what direction I need go further: do I want to make it a large-sized color graphic artwork, or do I want to make it oil painting. In first variant I will continue to paint with acrylic paints smaller details and patterns until the work will look like oriental carpet. In second variant I will need to use oil paints and to hide with them some details of the present canvas. STAGE 10a. Here you can see zoomed left bottom part of the painting. The first variant of the tree was not nice for me and I repainted it. Now it looks more integrated in the whole view of the canvas. 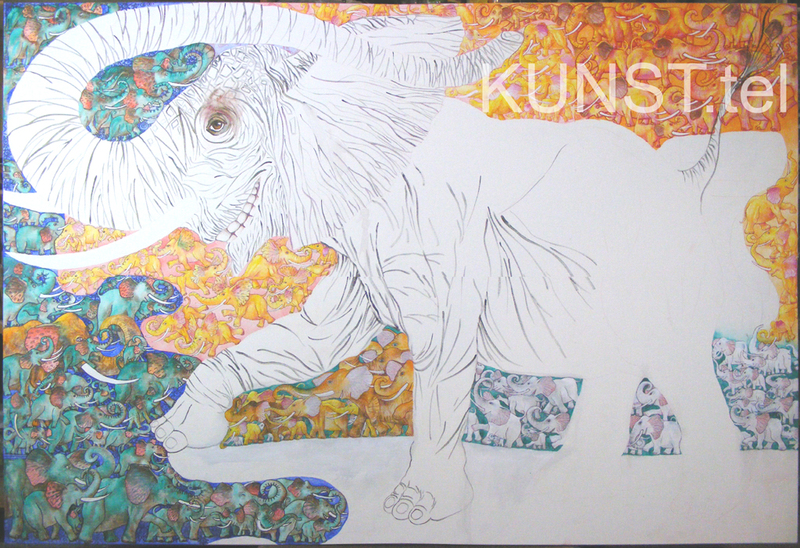 Also in this part of the canvas I made some amendments to the bodies of all small elephants. 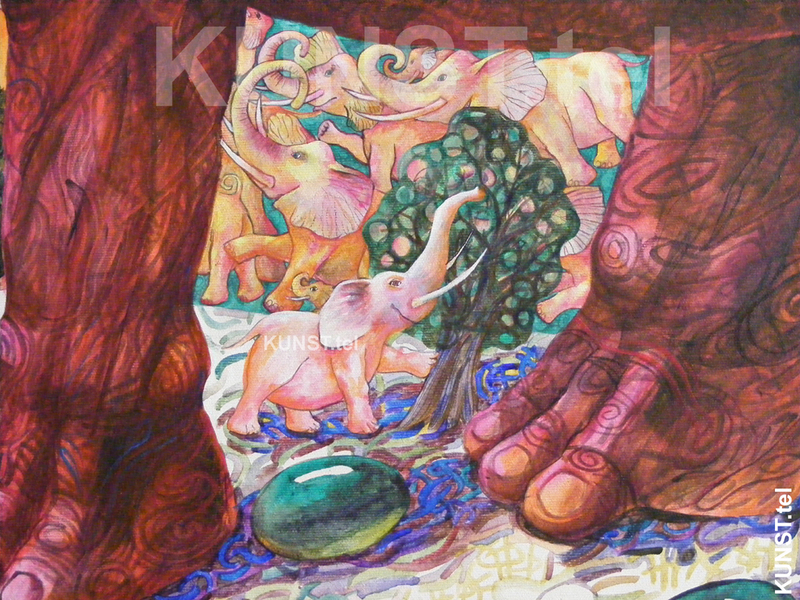 And I also filled with emerald and white beads the blank space under the belly of big red elephant. Now it looks more interesting. STAGE 9a. Here I put the zoomed details of three little white elephants. Sometimes fragments of a big picture look very nice – as a separate artworks. I heard that Paul Cézanne in the beginning of his artistic career, if nobody wanted to buy his still-lifes on large canvases, he cut canvases to smaller pieces, stretched them on under-frames and then he sold them as small still-lifes. STAGE 8. After few days work I perfected elephant’s shoulder. Also amended another muscles of his body and began modeling toes on his legs. 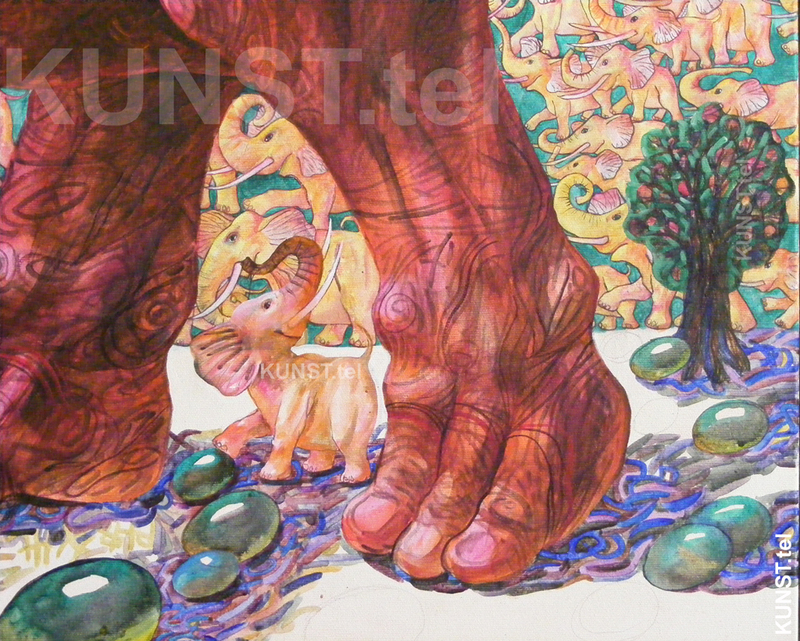 On the background I made some details on tusks of small elephants. Also I painted some places in the group of small elephants, which are between his front legs. The most difficult thing in arts is to find a right idea, which will give an interesting intrigue for the future painting. For few weeks I lacked a good idea for that blank place, which lays beneath the abdomen of big elephant. 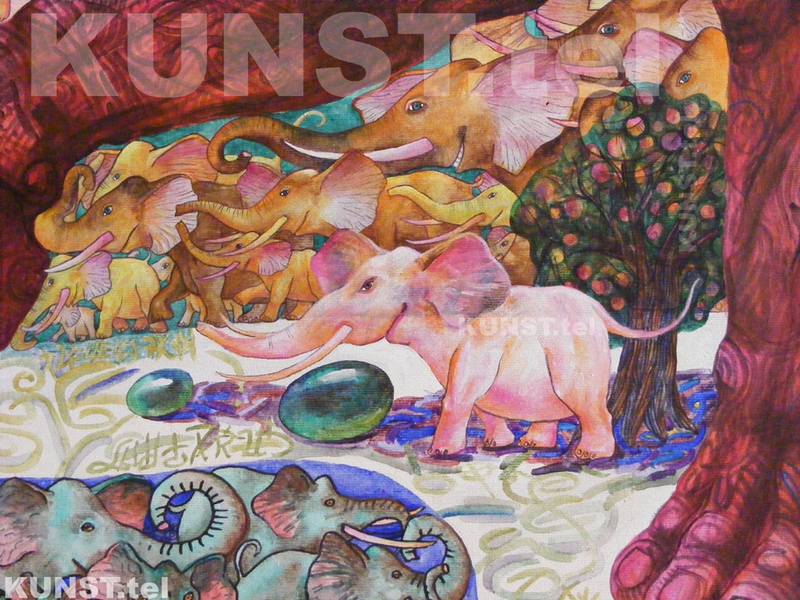 At least the artistic idea came to me and I decided that it would be nice to put there few trees and to make an alley of trees, which will go horizontally along the canvas and to put there few gay little elephants. Also I thought to paint there few big emeralds, but decided instead to make some green objects like pearls made of water or beads made of green glass. Tomorrow I will try to do something with the rest of that blank space. May be I’ll put there some talismanic signs, looking like letters from a long time ago forgotten elephants’ language. STAGE 7. Here I began modeling muscles of the elephant. They are not perfect yet, but I hope that I will manage to make them looking nice. They are not finished yet – a lot of work yet waits for me. STAGE 6. 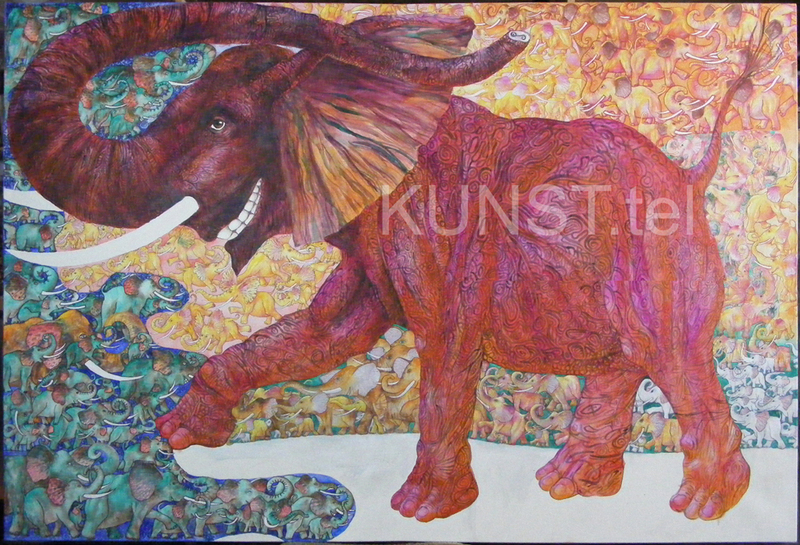 I choosed the red color for the body of my elephant. May be in nature they rarely are of a red color, but as we are artists and not hunters, we can choose what we want when we are in the dreamland of Art and are creating there our own worlds. STAGE 5. 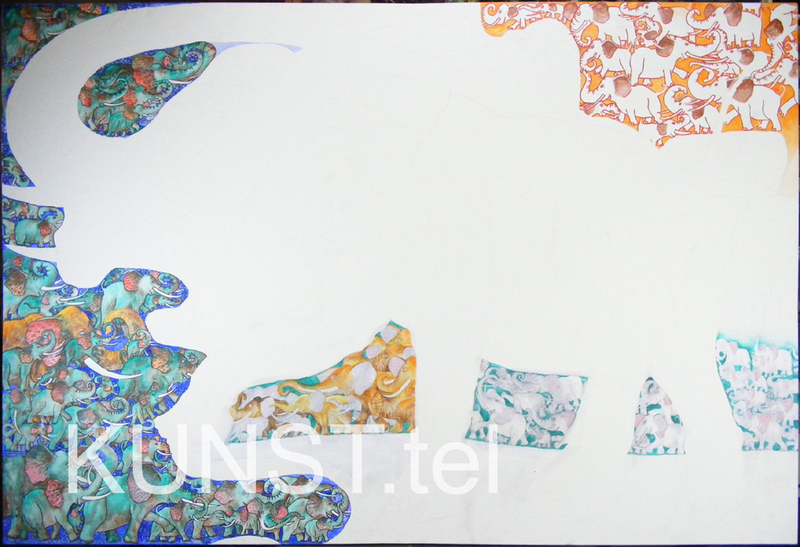 Now I began to paint the body of the elephant. 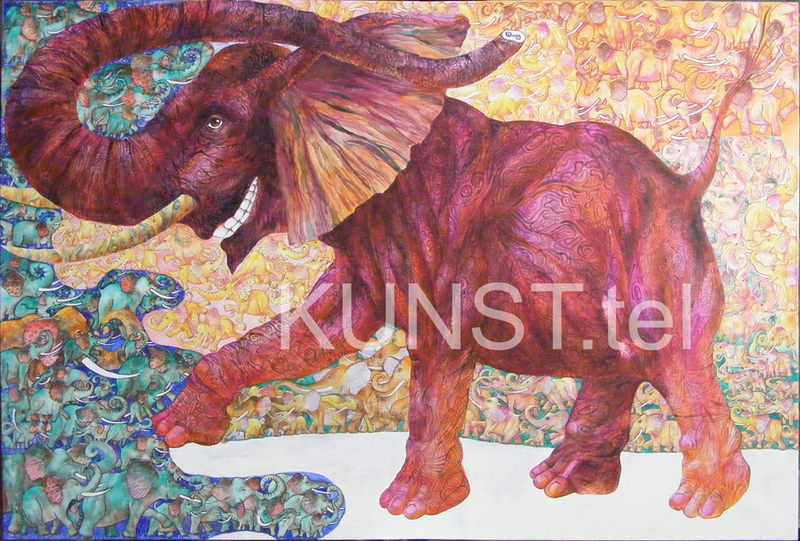 As we know, elephants have a lot of folders on their thick skin, so it is a difficult point of painting this animal. Elephant with a smooth skin would have a look of a rubber balloon, not of a real elephant. Here I began to make his skin folders with black acrylic paint. STAGE 4. Here you can see the beginning of canvas with acrylic paints. 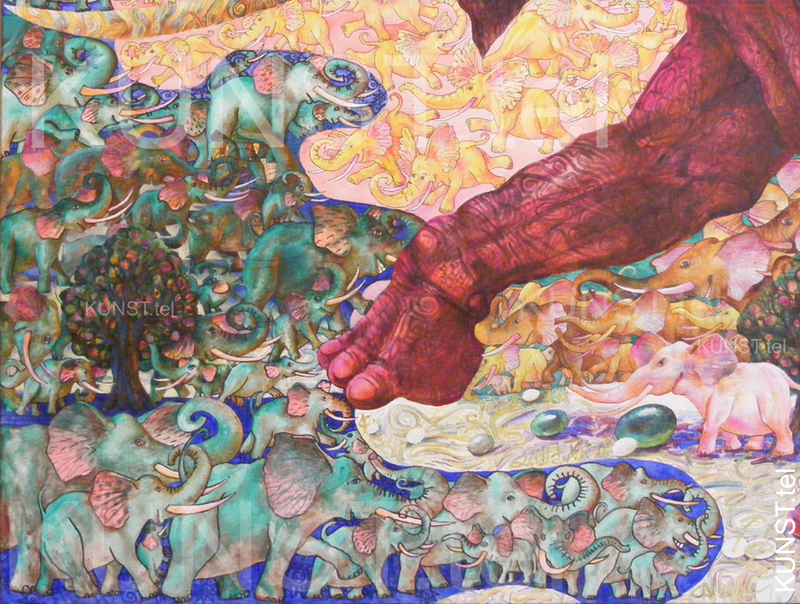 The background consists of lot of small elephants – that was an artistic idea of this painting on canvas. STAGE 3. 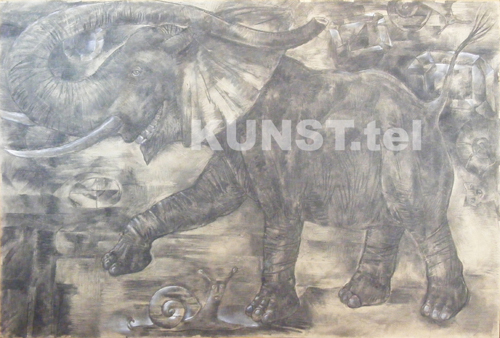 On this charcoal drawing I combined the figure of elephant from the second drawing and the background from the first sketch. STAGE 2. 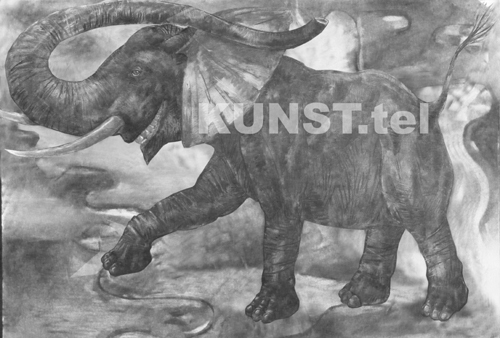 This charcoal drawing is based on the first sketch bellow, and is made with charcoal on a big sheet of paper in the natural size (1 x 1.5 m) of future canvas. STAGE 1. Here is the first picture. 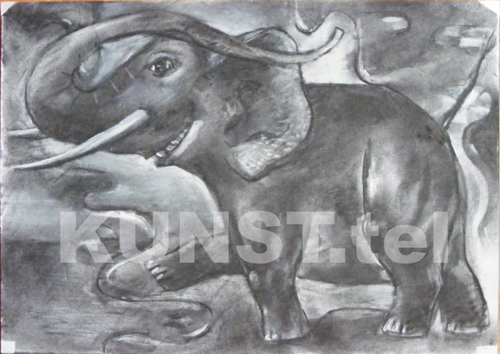 It was made as charcoal sketch (on a small sheet of paper) and it shows the primary idea of a future painting.